President Recep Tayyip Erdoğan said Saturday there are "many lessons to learn" from the collapse of a residential building in Istanbul's Kartal district where at least 17 people have died. 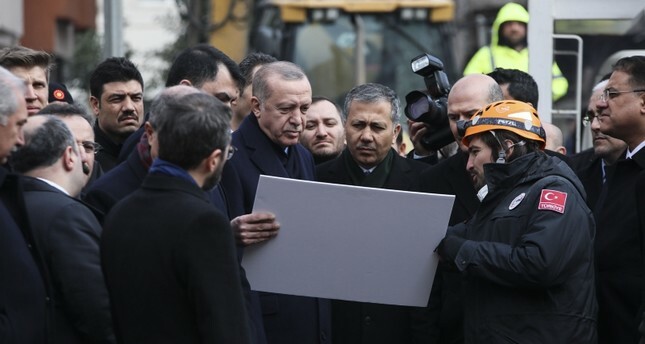 Speaking to reporters from the scene where the eight-story building collapsed Wednesday, Erdoğan said the government would take "steps in a determined way" after investigators complete their work. "This is not a natural disaster. These events happened because of the illegal buildings constructed just for the sake of earning more money, without adhering to safety norms at all. We are examining all buildings in the area," the president said sternly. Earlier, Health Minister Fahrettin Koca increased the death toll to 17. Erdoğan also visited a training and research hospital where more than a dozen people are being treated after the collapse. He and other officials later joined the funeral prayers for the Alemdar family, nine members of which died in the collapse, following his visit to the hospital and collapse site. Five other members of the Alemdar family, including two children, remain hospitalized. Fourteen people have so far been rescued, seven of whom are in intense care at the hospital. Interior Minister Soylu said earlier Saturday that search efforts were stopped in the middle of the night because there was a risk that the neighbouring apartment could collapse. Teams continue monitoring the adjacent building with tracking devices, Soylu added. Local residents had been evacuated earlier due to risk of collapse, Anadolu news agency said, without elaborating how many were affected. The cause of the collapse is under investigation but officials have said the top three floors of the building were built illegally. The eight-story building came crashing down Wednesday in Kartal, a densely populated district on the Asian side of Istanbul. The incident raised concern about the country's problem with illegal construction and interpreted as a warning sign against an earthquake risk.